A gift basket for any and every occasion! Show your love with a basket of goodies for your best friend. Basket includes 1 bag of Cheddar Cheese Stars, 1 bag of Peanut Butter treats, 1 bag of soft chew peanut butter and carob chip cookies, TWO (2) Paw Print bags of assorted cookies, and a bag of decorated cookies (Honey Granola Bite Me bone, French Vanilla Cupcake, Ice Cream cones) , and a bag of yogurt dipt Meaty Bones. Basket dimensions are 10"x6"x7". 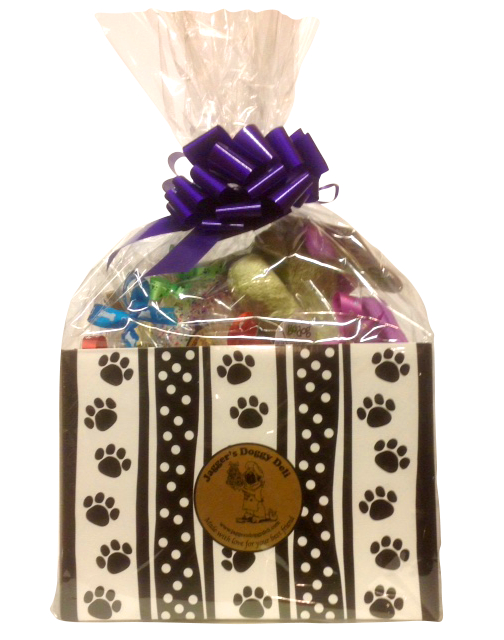 A great gift from a loving owner, friend, or a thoughtful breeder!